Prout has a proven track record for their superior quality and off-shore capability. 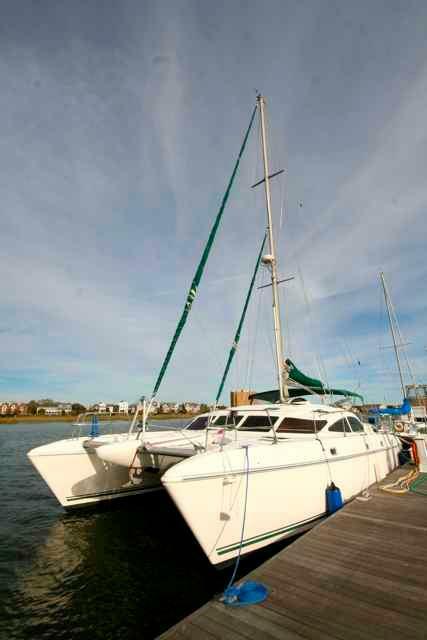 This boat has not been left on the dock, and the owner has enjoyed numerous passages on her, proving the boat's mettle. 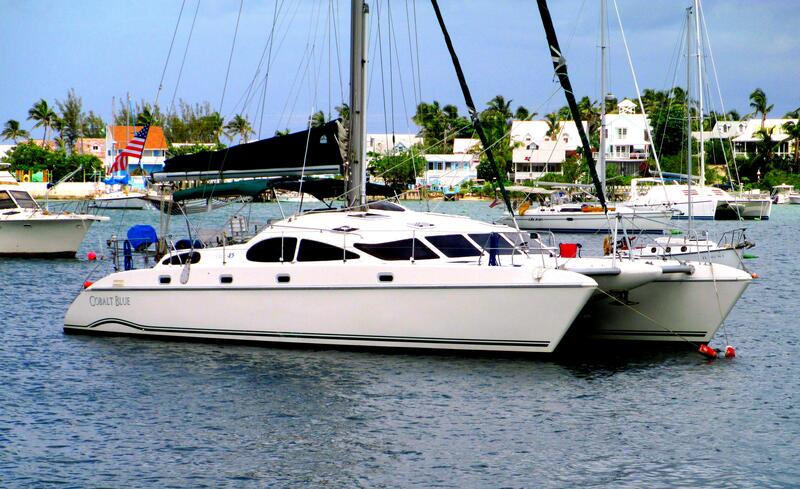 She is a bluewater cruising catamaran that will please. Cobalt Blue received a thorough upgrade in 2013 including new saildrives - and no expense has been spared to make her ready for her next voyage! 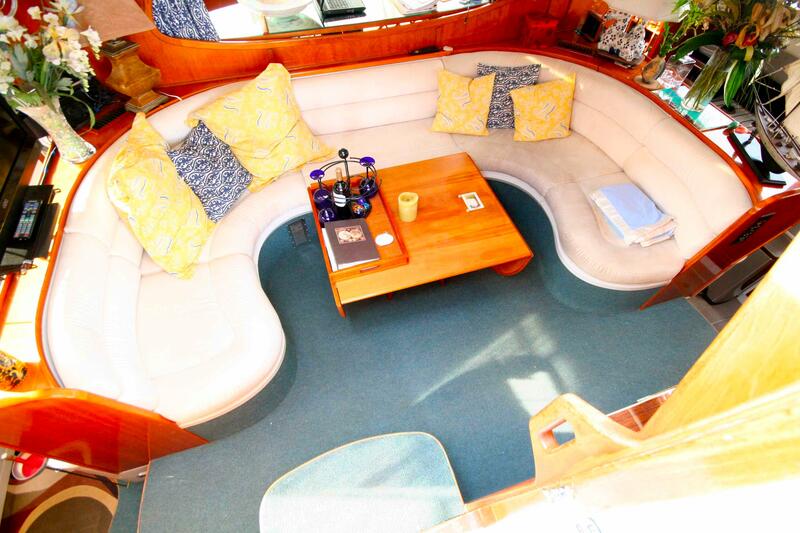 This boat offers a wonderful opportunity to cruise or live aboard in comfort, with all the amenities. Packed full of innovative features, the Prout 45 has wing keels, diagonal torsion control bulkheads and a unique structural system, technology used to make cruising easier and safer. She is easily handled by a shorthanded crew, with all controls led to the cockpit where excellent all-round visibility makes handling in close quarters quite easy. The aft steps and reasonable gunwale height make access from the boat to the shore, or jetty quite simple. The aft-stepped mast, unique in a craft of this size, ensures simple and safe sail-handling with the minimum of effort. Designed to accommodate generators, air conditioning, washing machines and all that the modern cruising sailor requires, the Prout 45 is offered in four innovative accommodation layouts that enable it to be tailored to suit individual taste and cruising style. This boat is configured in the 3 stateroom "owners version." All Prout catamarans are designed and constructed by yachtsmen to combine technology with traditional boat building skills. Prout Catamarans was the first boat builder in the UK to receive Lloyds ISO 9002 quality standard recognition. Prout prides themselves in keeping in touch with owners through an excellent after-sales service and a strong owners association. 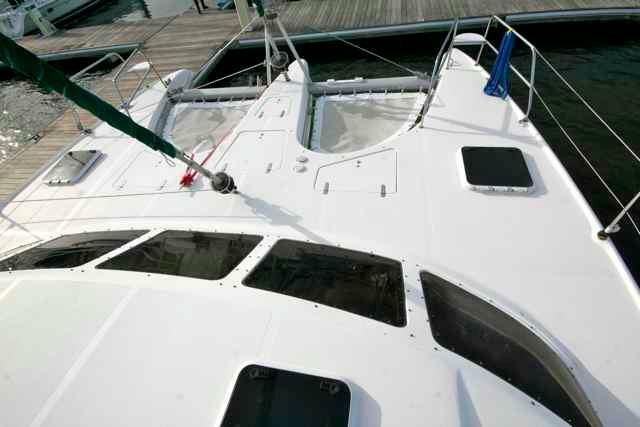 By it''s nature and design, catamarans are spacious and stable. The hulls provide copious amounts of space and storage, giving the bridgedeck the ability to provide voluminous living areas. This particular design has incorporated a master stateroom midships on the bridgedeck. It is in the foremost portion of the bridgedeck, and access is on either side from either hull. The berth may be a king or two singles. 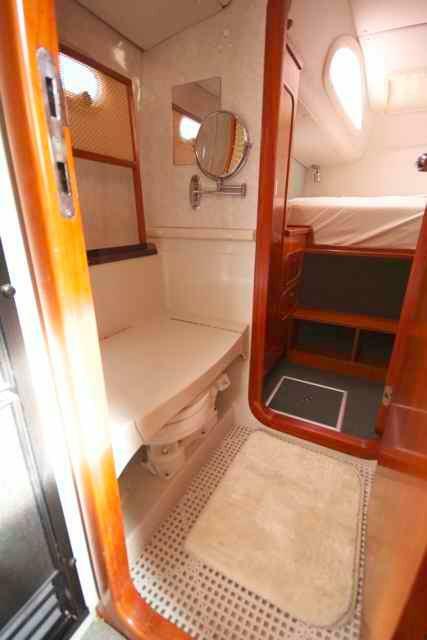 There is a hinged bulkhead which encloses the cabin, giving one complete privacy. When dropped down, and open, it provides for a larger area and allows more light into the salon. It also provides additional light as it is decoratively mirrored, reflecting any light from hatches and the forward windows. The salon has a large U shaped settee which will seat 6 or more for meals. Access to the cockpit is via a folding plexiglass door, above which is a "bubble" allowing one to watch the sails from the comfort of the salon. 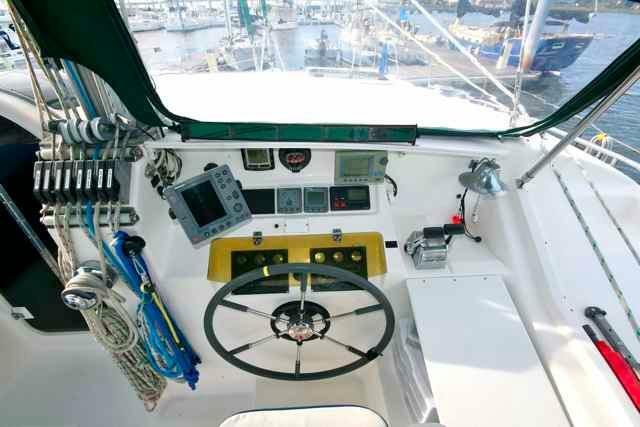 On the aft bulkhead of the salon is the access to the helm station equipment, including the hydraulic steering. 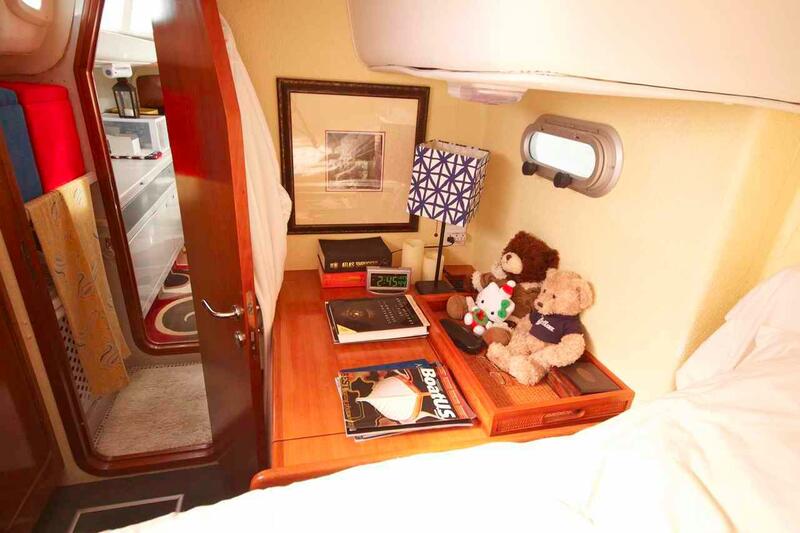 The port hull has a cabin with a queen berth, on top of which is a Beauty Rest Pillow Top mattress, with a desk, drawers, and a large locker with more shelves for storage. There is plenty of ventilation and light provided by the hatch above and a porthole on each side. Just forward, inboard, is a vanity with hot and cold water, as well as a shower rail. Opposite is more storage. Moving forward outboard is a freezer, and lockers for storage. Opposite is the nav station. Further forward, toward the bow area, is a full head and separate shower. The manual head itself is inboard, opposite the vanity, which has storage underneath. Forward of that is the separate shower. 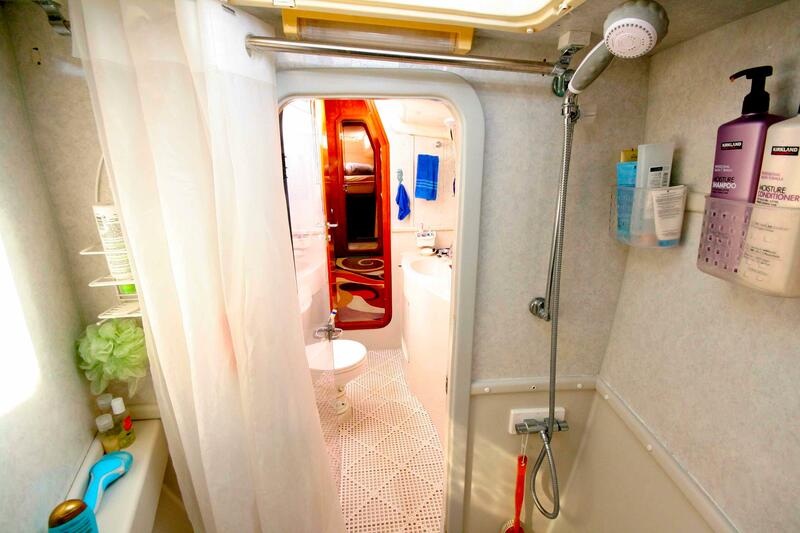 There is an access panel forward of the shower to the bow. As one enters the head there are two molded steps, bringing one up to the main cabin located midships. 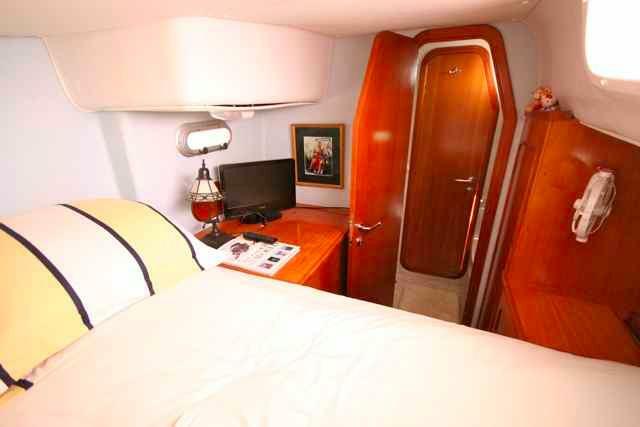 The starboard hull has a full queen berth, with an 11" memory foam mattress, located aft, with ample light and ventilation provided by the hatch and portholes. There is a desk with drawers, as well as a hanging locker . Just forward is a self contained head and shower. Forward of that is the galley. Moving forward past the galley is another cabin, currently used as pantry storage, which has two sea berths. 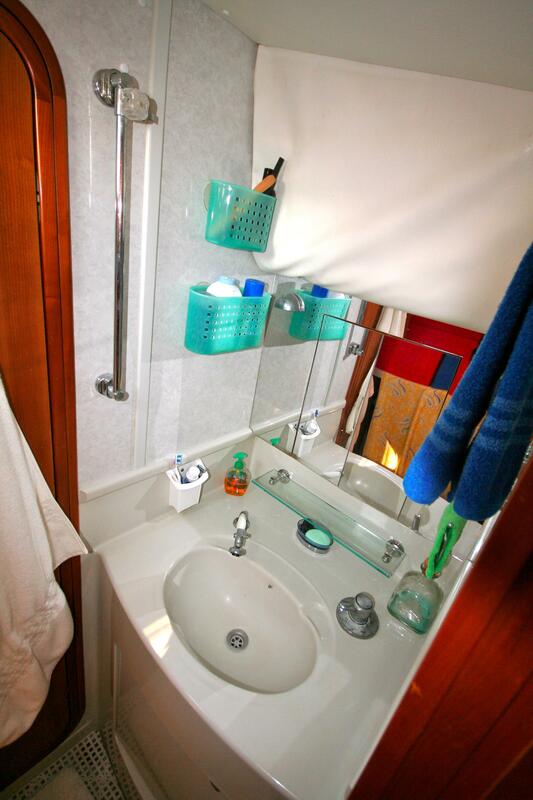 There is also access to the master cabin located midships. Forward of the access is a large bench seat, which leads one into a walk-in locker area, currently being used as a hanging closet. 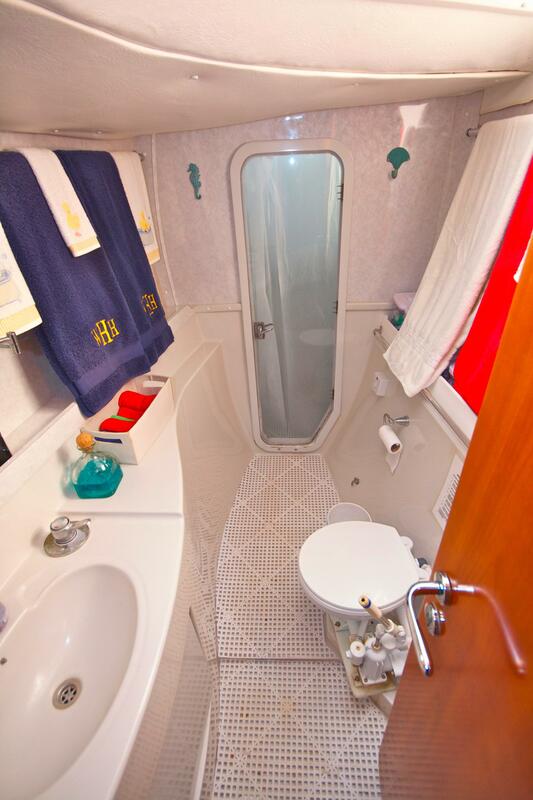 All the vanities on-board have mirrors, hot and cold water, and the ability to be used for showering. The hot water heater was new in 2012, and there is an auxillary diesel fired hot water heater. 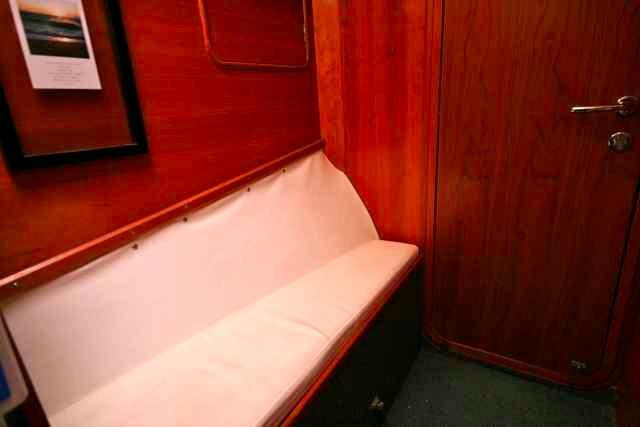 The interior has Cherry paneling, and is carpeted almost throughout, making the boat feel like home. The entire boat is heated and cooled by 2 reverse cycle units - Cruisaire and Flagship Marine (2016} There are control panels in the staterooms, as well as in the salon. The galley is longitudinally configured, galley down, in the starboard hull. It is complete, and one can safely and comfortably make meals while underway. Inboard there is a custom extra large Stainless Steel sink. Above are lockers for storage, as well as storage areas underneath the sink. Outboard is a 3 burner propane stove. 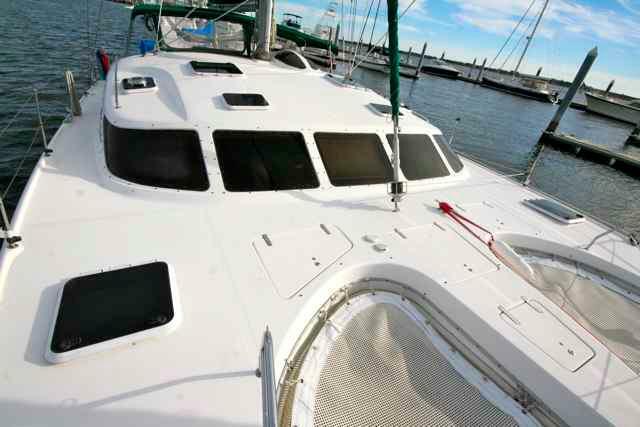 The owner brought a countertop microwave oven and a countertop Convection oven to the galley in 2015. Although the third freezer, an Adler Barbour 12 volt unit was removed for refrigeration, it will transfer with the boat. 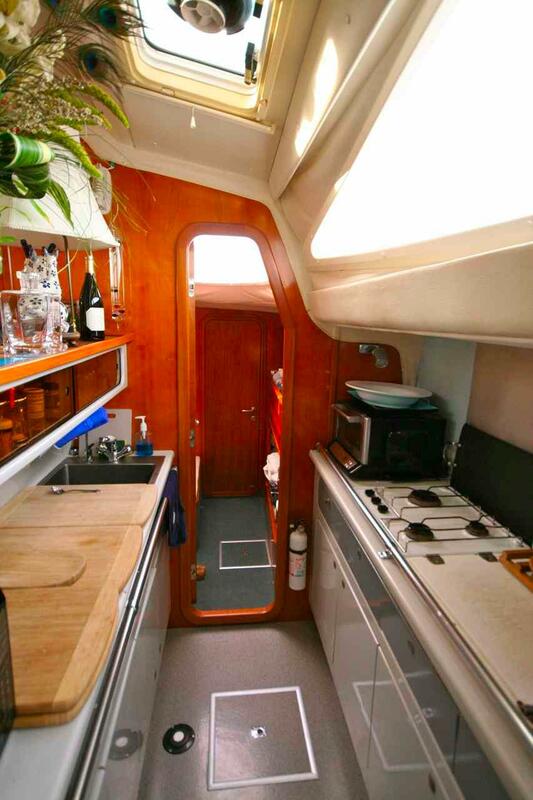 The owner installed a built-in Norcold fridge/freezer in 2011, and there is also a Grundig freezer in the port hull.There is a salt water pump at the galley sink. There are integral water tanks in the bilge with a capacity of 140 gallons. The propane is housed in a dedicated propane locker which is vented. There are 2 30 lbs aluminum tanks. 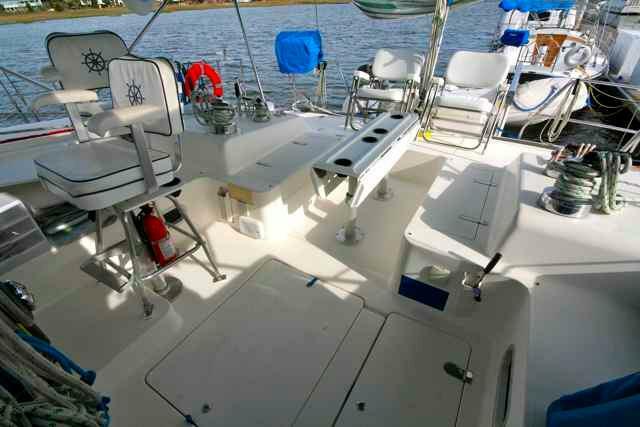 The boat is equipped for serious bluewater passagemaking, and the electronics on board ensure a safe and easy passage. There is an Autohelm ST7000 Autopilot located at the helm, as well as Raymarine ST60 wind and Raymarine SL60+ depth and a Raymarine SL70C radar/chartplotter. Also, an extensive collection of East Coast and Bahamas charts (print and digital) is included. The nav station is located in the port hull, inboard, and has a large nav desk. It slides out, giving one access to stored charts. 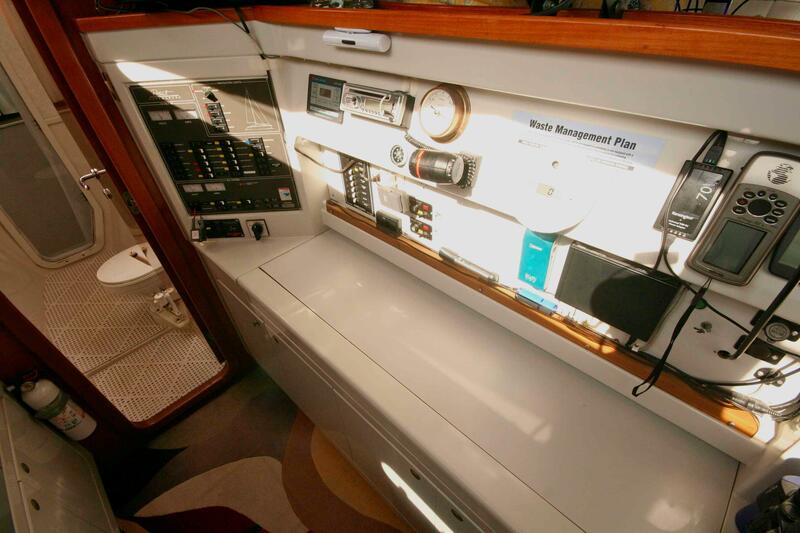 There is a Garmin GPS, an Icom 710 Single Side Band, a Standard Horizon VHF radio, and an ACR Cat II EPIRB. 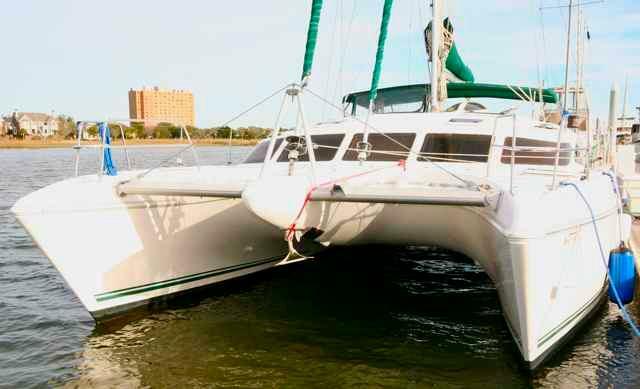 By its nature, a catamaran offers a stable platform, even in a sea. 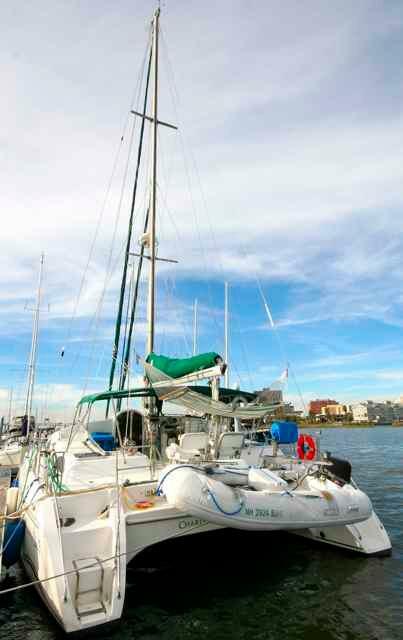 However, safety is still an issue, and this boat is configured for short-handed sailing if necessary. The lines are led to the cockpit, alongside the helm station, and all controls are within reach in the cockpit. There are stanchions and lifelines around the deck, as well as jackstays should one need to move forward. The mast (63 feet) is supported by 10 SS cable systems adding further structural security for the serious blue waer sailor/cruiser. There are Simpson Lawrence SS davits for the 10'' West Marine PHP-310 hard floored dinghy (2017), and access to the boat is via the transom steps, either port or starboard. There is also a 5 HP Mercury o/b, which was serviced in 2017. 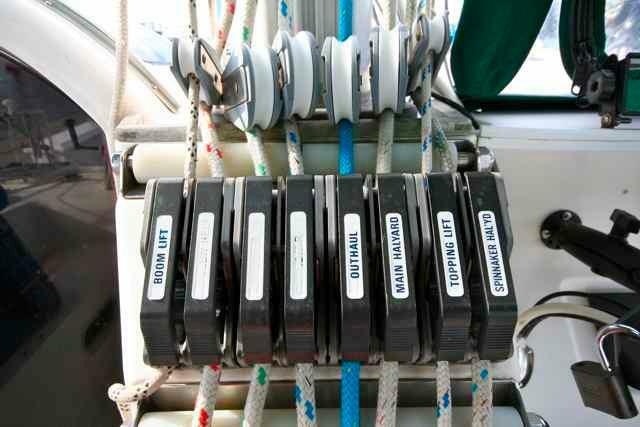 The primary winches are Lewmar ST 50''s and the secondary''s are Lewmar ST 30''s. There is also a Lewmar 30 halyard winch, to assist in raising the main. The standing rigging was upgraded and Norseman fittings are used for the rig. The chainplates have been inspected and upgraded as well. The salis are all Doyle: Offshore fully-battened main with lazy jacks and stackpack. The Genoa is an Offshore with a Profurl roller furler. The staysail is an Offshore with a Profurl roller furler. The spinnaker is assymetrical, and there is a Forespar mast-mounted pole for downwind work. There are 2 anchors on the boat. The primary anchor is a 65 lbs CQR with 250'' chain and 200 '' of rode. The secondary anchor is a 45 lbs CQR with about 50'' of chain and 200'' of rode. The windlass is a Simpson Lawrence Horizon 1500 with dual foot controls. The motor was replaced in 2013. There are 2 bow anchor rollers, as well as a stern anchor roller. As one would expect with a vessel such as this, the boat is equipped for extended crusing or dockside living, while maintaining a high level of self-sufficiency. There is an 8KW Northern Lights generator. This is a large enough generator to provide sufficient power for the boat''s needs while underway. 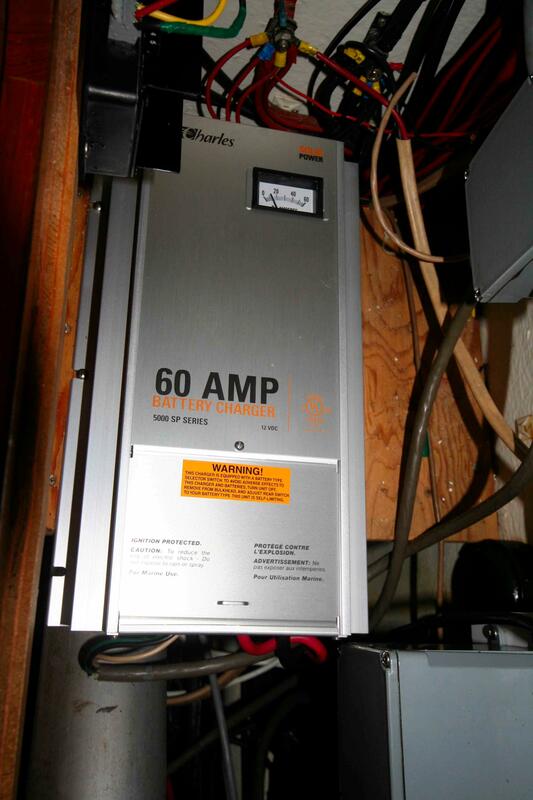 There is a Charles 60 Amp battery charger (2012) for keeping the 12 volt system running, as well as a Link 2000 battery monitor. (disconnected)There is also a Heart Interphase electrical system monitor (disconnected). and from 2015 through 2018 the batteries for the engines, generator and house were replaced, as were the matching 100 AMP alternators. The entire electrical system has been inspected and where appropriate upgraded and components replaced. It is literally up to date, new, and ready to cruise.(2013). Access to the engines is either through lockers in the aft deck, or under the berths in the aft cabins. They are Volvo diesels - MD22L-A, 50 HP each, with Volvo-Penta 130S saildrives and props that were new in 2013. A Spectra water maker was factory rebuilt in 2005 and is currently "pickled" till ready for use. In order to ensure maximum efficiency, and reduce the risk of engine failure, there are dual Racor water separators for each engine, as well as a primary filter on each engine. There is a fuel manifold system that allows crossover from each engine to each tank. The tanks are aluminum epoxy coated, and hold about 164 gallons. Starting forward is a crash bulkhead. A separate shower room with seat and solid door leads next to the large Master head and sink area. A door to the master SR is inboard with a second door leading aft. 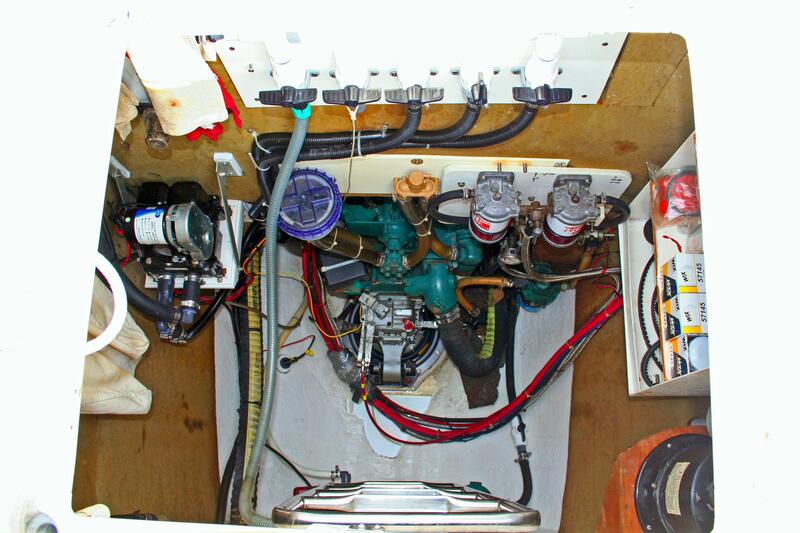 The midship area has a navigation station inboard and cabinets with freezer outboard. 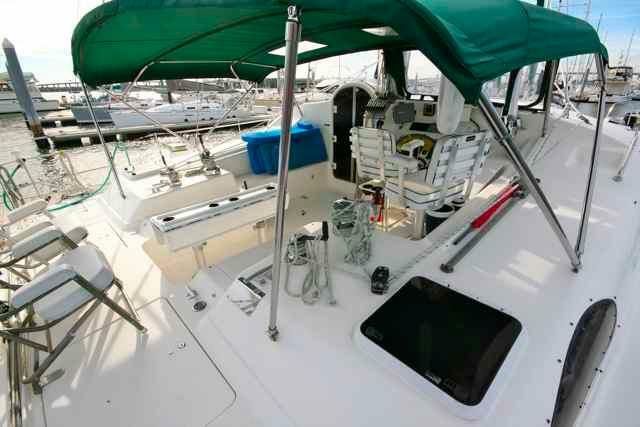 The outboard area can also be fitted with a navigator''s sea berth. Detailed navigation information to follow. Next aft is a laundry with washer/ dryer connections outboard and sink inboard. 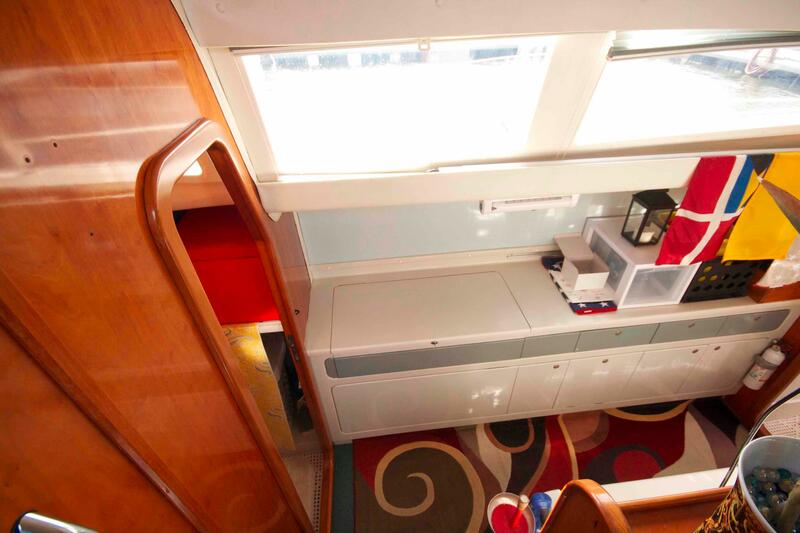 A Queen Stateroom aft includes closet, drawer storage, vanity and bookshelves. The Master stateroom is located on the bridge deck under the large coach roof windows. 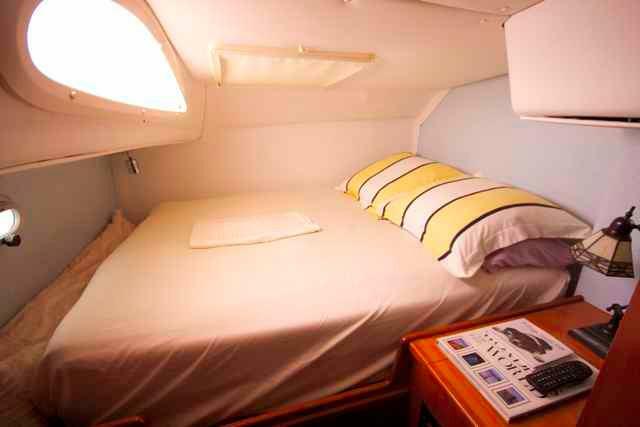 The area can be configured for sleeping two people either in a King berth or two single berths. The beds can be situated fore and aft or athwartship. To port there is a private entry to the master head. The area is fitted with closed cabinets and bookcases as well as storage under the floor. The aft bulkhead is hinged to be closed for privacy or open for daytime access to the saloon. 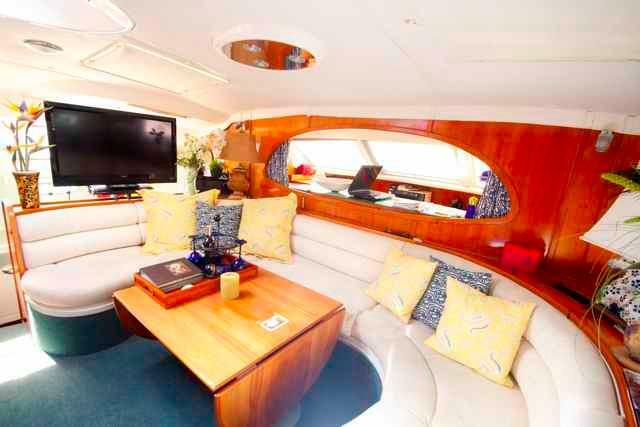 The saloon is fitted with a "U" shaped settee with an etched mirror panel that will seat eight for meals. The Pleather upholstery was new in 2010. Starting forward is a crash bulkhead. 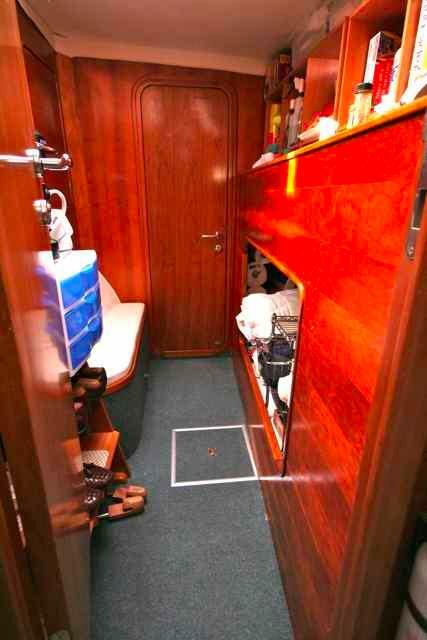 Next is a large storage area with door that can be used as a walk-in closet for the Master Stateroom. A dressing/ sitting area follows. Outboard is a storage area that can also be fitted with two offshore sea berths. Inboard is two steps up to the master SR and a small settee. The galley is amidship. Details to follow. 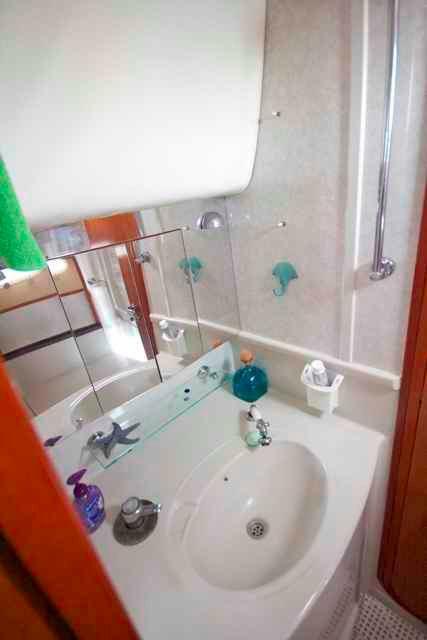 Moving aft is an ensuite head and shower and Queen stateroom with closet, drawer storage, vanity and bookshelves. 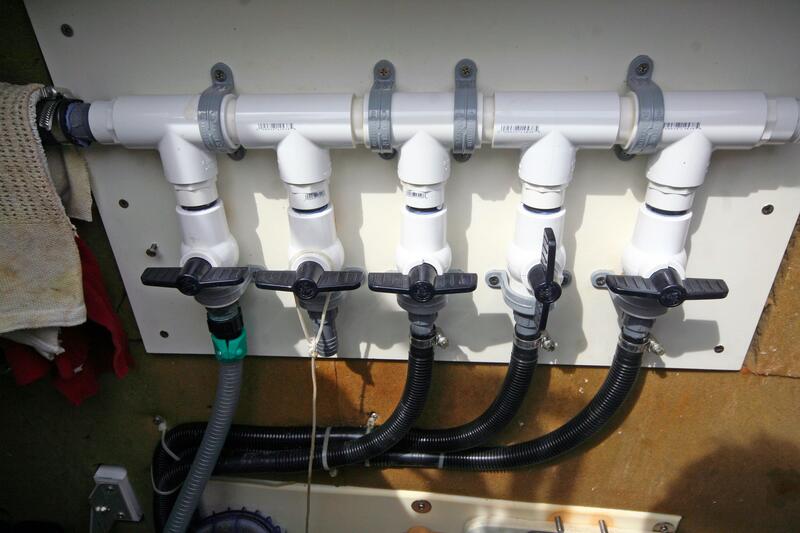 Installed a custom bilge system using dual manifolds. 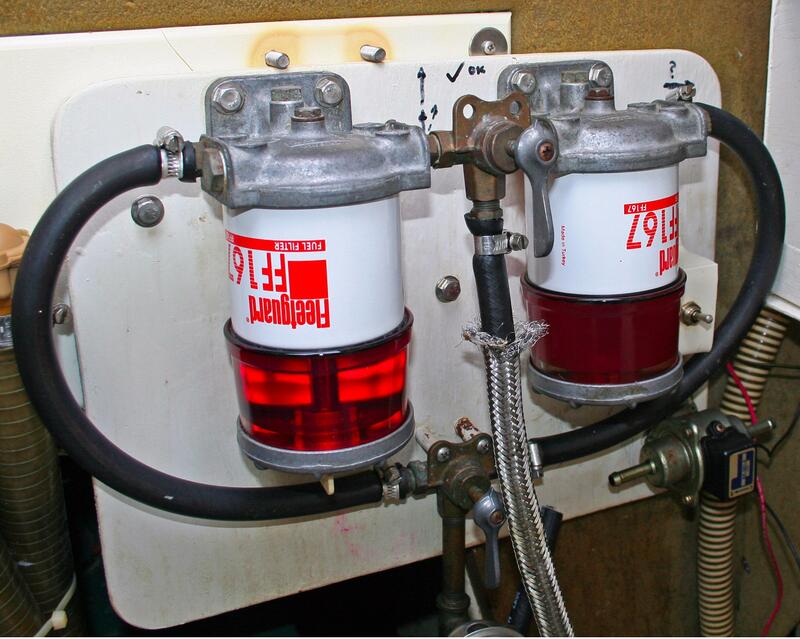 There are two (2) Jabsco bilge pumps, two automatic bilge pumps with float switches, as well as 2 110 volt emergency bilge pumps.There are also dual bilge alarm systems. Completely overhauled the hydraulic steering, aligned the rudders and added boot frames. Refurbished the A/C systems, including 2 new saltwater pumps and 3 new triacs. Refurbish/replaced genset cooling system, replace batteries, electrical outlets, shore power cables, new electrical board, etc. Almost $150,000 in maintenance and upgrades over the past seven years!